When you visualize your dream wedding reception, Pinterest-worthy table settings probably come to mind. 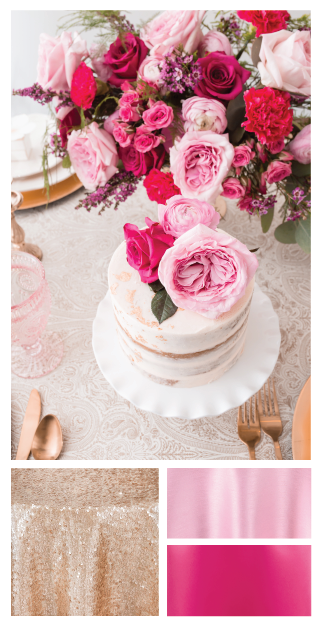 Linens play a major part in achieving dreamy tablescapes and bringing your wedding vision to life, and it’s important to keep a few things in mind when choosing which types of linens to use. When decorating your wedding reception, think of the tables as the base for your entire look. Tables take up most of the space in the room, which means linens are the first thing guests will notice when arriving. Don’t be afraid to be bold or make a statement with your table settings! No matter your personal style or the color scheme of your wedding, there’s a linen out there that’s fit for your occasion. Maybe you want minimal table settings, which means selecting a linen that can speak for itself. Or, maybe you’re looking for a solid base as a linen so you can decorate the table with big centerpieces and fun accessories. Either way, you’ll need a tablecloth that ties the whole look together. Whether it’s a pop of color or a fun material, using a less-than-standard linen for your reception tables will create a focal point and create a cohesive look for the whole room. While the first thing people will notice is the tablecloth, there are plenty of other ways to incorporate linen. Chair covers, napkins, overlays -- they’re all key to completing the look. A beautiful wedding is in the details (along with a host of other things, like the people and the memories made, of course) and linen accessories are the perfect touch of elegance your reception needs to create the reception look you’ve visualized. There are so many choices to make when planning a wedding. After landing on major decisions like the date, the dress and the venue, it’s easy to get stuck on details like linens. That’s where your linen company comes in. Think of working with a linen company as having a teammate; your designer is here to help! Let your designer know what the rest of your table settings will look like and don’t be afraid to ask for their opinion or ideas. Everyone you work with to help plan your wedding wants to ensure that you’re getting the special day you’ve always dreamed of, and linen companies are more than happy to be a part of that! After you’ve found the perfect linens for your wedding, it’s time to make arrangements for the big day. Work with your designer to ensure you’re both on the same page about logistics and details. Discuss the number and size of the tables you’ll have, including additional tables for food or cake, as well as any extra details. It’s especially important to provide updates should anything change and you need more linens or different sizes. Planning details and logistics ensures the entire process is seamless and that you can check one more thing off of your list.